Princess Misty of Beldora is expecting to marry the prince of a neighbouring kingdom and live in boredom and contentment. However, her life changes when she is kidnapped by the evil Lord Badlug, who wants to marry her instead so he can take over Beldora. Prince Peter vows to rescue her and Misty waits for him, not to be rescued, but for him to bring her the magic sword that is the only weapon which can kill Badlug. The trick is making sure he survives long enough to reach the castle. Another Castle: Grimoire collects issues 1- 5 of the comic. It's a lighthearted story about a self-rescuing princess, but there is some depth to it as well. Misty discovers that the citizens of Grimoire are also affected by her actions, and are more than just a backdrop to her adventures. As it is pointed out to her "The story doesn't end when you get what you want. Some of us have to live here." The story is probably funnier if you're into gaming, of whichever type. The title is a play on the old Mario Brothers games where the hero is told at the end of a level that his princess is "in another castle", and the artist, Paulina Ganucheau lists the Zelda games as one of her influences. For tabletop roleplayers, bribing the monsters to take a fall instead of fighting them feels very much the sort of thing a Dungeons and Dragons party might do if it seemed the only way to get past them (Or perhaps the groups I've played with were just especially devious). It also reminded me a little of Robert Asprin's Duncan and Mallory comics, where a knight works out a scam with a dragon to pretend to slay him and then split the profits. Another Castle does contain some violence, but it's not very graphic, and there are no sexual references (just kissing) or swearing, making it suitable for younger readers. It could be read by a confident reader of 8 or older. It may also appeal to some adults, but doesn't have a great deal of subtlety or sophistication. On the other hand, the simplicity of the story is refreshing and I found it made a nice change to read something positive with an unambiguously happy ending. 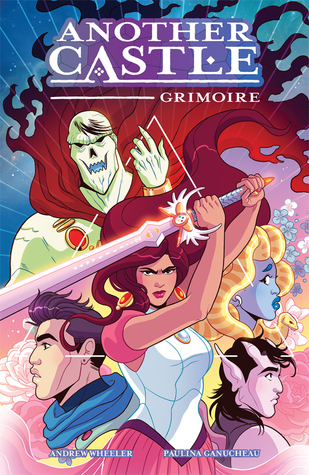 Another Castle: Grimoire is a lighthearted comic with great art and a simple story about a princess who doesn't wait for the prince, but sets about changing her own fate. Disclaimer: I was given a complimentary copy of this book by Diamond Book Distributors via NetGalley in exchange for an honest review. Why? Because self-rescuing princesses are awesome.